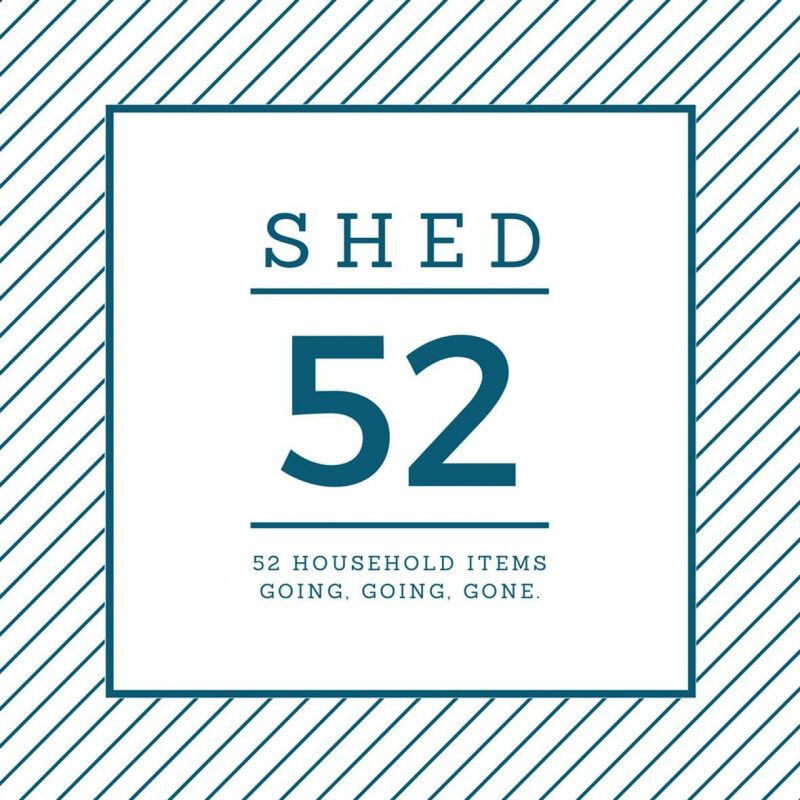 We’re here with a quick update, as promised, to fill readers in on the stressful seven days we just spent trying to sell the item we had selected for Week 4 on Shed52. We knew we were bound to hit some snags, and anticipated that we might have to pivot to make good on our commitment to this process. As the old saying goes, “When life hands you a vintage card table that nobody wants, try to sell it for a short while and then just give up.” It’s kind of the home organization equivalent of Lemonading. Kind of. I have a lot of old sayings I like to make up when things aren’t going my way, like this past week while I was wringing my hands over the Stakmore Set that nobody wanted. And you know? The longer we were trying to sell that thing, the more attached to it I became. I have virtually no use for it. I’ve never played Bridge. And it’s certainly not my style. But it’s still ours, because in a brazen sleight of hand on Sunday I decided to switch out the Shed52 Item of the Week and pretend like these poor old pieces were never up for grabs to begin with. But seriously, will someone please buy this? So how did we make good on our promise to keep getting old junk out the door for Week 4? In a series of hasty moves, driven mostly by impulse and instinct rather than intention, I found myself scanning the house on Sunday for anything that looked like we could live without it. It’s not exactly the conscious uncoupling we’ve been humble-bragging about practicing on this blog, but we were feeling a little desperate and short on time, now that we’re also trying to get Jason’s mom out of southern Florida a week early for her upcoming visit to Boston. I ended up almost overlooking this nifty doodad, which I’ve had for probably 15 years. I call it a doodad because I have no idea what it actually is, or what it’s for. It’s moved across 3 cities and 5 apartments with me, and to this day, I have no idea what to do with it. This photo might fail to capture just how small those teeny drawers are, but each one has enough storage for about two earrings and a hay penny. I also have yet to explain my bemusing habit of leaving my jewelry everywhere (that’s for another post) and so needless to say, this doodad never had a chance at serving whatever its teleological purpose may be. I realized that it’s offering neither form nor function for us at this point, and at about 7 pounds, it weighs more than I’m willing to schlep to any other apartments if we ever have to move. So I slapped a post-it on it (“Free!”) put it on our stoop and waited like Joe Biden in the window totally casually to see if there would be any takers. And then I accidentally fell asleep. But! When I woke up, like magic, the nifty doodad was gone. I assume some eccentric neighbor with exactly 6 pairs of earrings serendipitously stumbled upon it and that it was the answer to all of their tiny-home-storage problems. It’s probably as close to feeling like Beyonce as I’ll ever get. And yes, I know how sad that sounds. In any case, we were able to at least ensure that we’re one more item down in the quest to de-clutter, and looking ahead to the rest of our shedding the rest of our stuff. What’s on tap for Week 5? My confidence is a little shaken by this past round of Shed52, but I’m holding out hope that we can appeal to the masses with a few bicycles the kids outgrew like 6 years ago. If you know anyone in the market, get at me. They’re in great condition and I dare you to say “no” to a muppet on a bike. This could be you, reader, if the price is right. I love that little doodad, and I hope the eccentric neighbor with 6 pairs of earrings loves it! Could the table and chairs be reupholstered/painted? They have nice shape, in my opinion. Ooh, that’s so interesting! I wasn’t sure if the top was padded or just a matching color to the chairs’ padding. I definitely think it could be useful — maybe put onto shorter legs as a coffee table, good for resting your feet on? (Though, that would eliminate the need for the chairs…) Maybe a breakfast-nook-type table?